Erik started as an EMT in the Metro West Wheelchair Transport Division back in 2011, then in 2014 he became a Nationally Registered Paramedic. 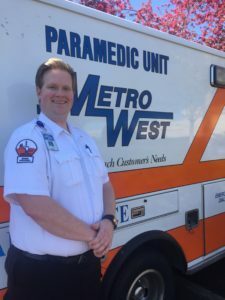 For the past two years, Erik has worked as a preceptor, mentoring Paramedic students throughout their internships, patiently sharing his knowledge and experience. Most recently, he has been promoted and is now serving as Metro West Ambulance’s newest Field Training Officer. Metro West is celebrating Erik as the Star of Life for 2018 not only for his professional development in the organization but, more importantly, for his dedication to patient care. This past fall, while off-duty and on the way to work, Erik came upon a serious accident where a pedestrian had been hit by a vehicle. Erik parked his car nearby and assisted with initial patient care, and he later ended up assisting the crews with the emergency intubation and transport to the trauma center. On that call, and through his mentoring of new Paramedics, Erik has exemplified his dedication and service to EMS. We are proud to have him as Metro West’s 2018 Star of Life.